The instructions here come from Apple Support Article HT204649 which deals with an error message from iTunes. It’s the same root cause, but you’d never find the article if you search for anything but iTunes. iCloud System Preference includes the words "Verification failed" while the Mac App Store simply says "This action could not be completed. Try again". It’s possible that the Shared User folder has become locked. If you right click on the Shared User and choose Get Info, you can view the Sharing & Permissions. In the screenshot below, you can see an entry called "everyone". You want that to show Read & Write as the Privilege. 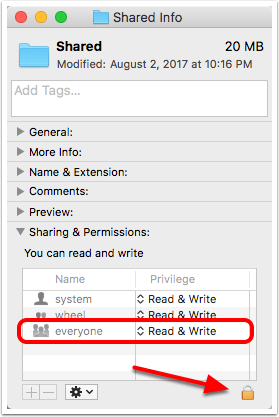 If you see an entry for everyone, try to change the privileges to Read & Write. You’ll need to first click the lock in the bottom right to change this setting, and then enter your administrator password. If you’re unable to do this, read on to the next step. If you’re uncomfortable or unfamiliar with using Terminal commands, you should most definitely not do this without geek supervision. There is a possibility you could do harm to your system that is difficult to repair. But if you’re adventurous, proceed. But I warned you, right? Open the Applications folder, then the Utilities folder, and inside this folder open the Terminal application. The screenshot below is from the Apple Support article HT204649 referenced in the introduction. I’ll walk you through this in the next step so you can copy/paste the command, but I wanted you to see the article yourself. One line in the output should be about your Shared folder and it should match what I show below. Note the letters at the front of this line. It should say exactly drwxrwxrwt. 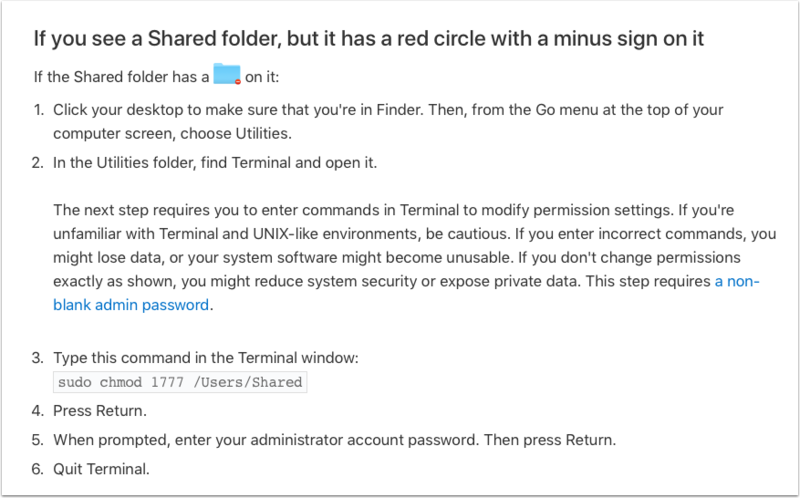 You can also navigate to your Shared User folder again and you should see that the red lock icon has been removed from the folder as shown below. I’m not sure if this will fix anyone’s problem, but it took four days with Engineering support AND executive-level assistance at Apple before they found this solution for me, and it fixed my problem.